Prototype: German State Railroad Company (DRG) type C4ü Halle "Hechtwagen" / "Pike Cars" compartment car, 3rd class. Standard design based on drawing designation C4ü-23. The car looks as it did around 1931. Model: The car is constructed with many details and comes in the full length for the scale. The underbody and the swan neck trucks are specific to this car. The car has separately applied ladders on the car floor. There are also additional ladders on the ends of the car. The car is made to look as it did in Era II with a brownish green paint scheme. The train destination sign is imprinted on the car. The 7319 current-conducting coupling or the 72020/72021 current-conducting close coupler, the 73400/73401 (2 per car) lighting kit, and the 73404 pickup shoe can be installed in the cars. Minimum radius for operation 360 mm / 14-3/16. Length over the buffers 23.7 cm / 9-5/16. DC wheel set 4 x 700580. Different car number from that for item no. 42252. The class 39 express locomotive to go with this car is also being offered under item no. 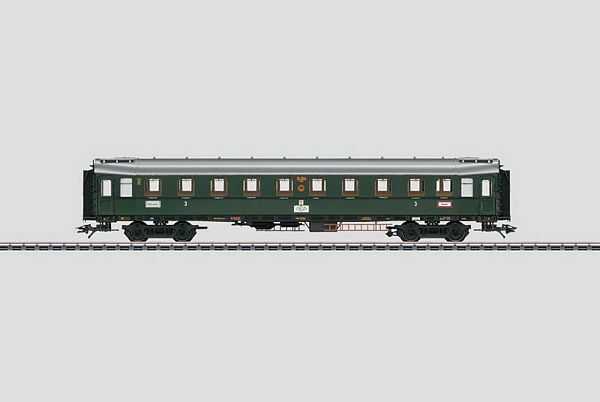 39392 in the 2011 Marklin new items assortment.